Roanoke mayor on refugees and Japanese internment camps. The real lesson of America’s Japanese internment camps is that fear makes us cowardly and vicious. 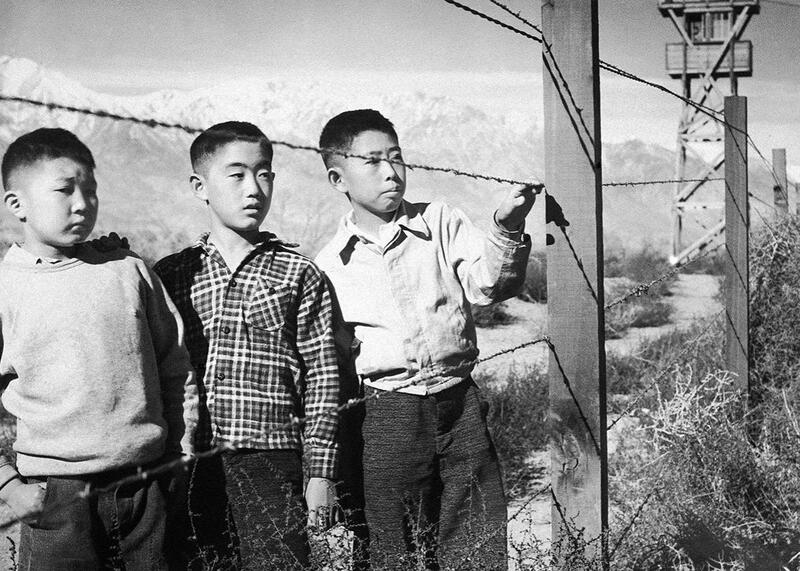 Japanese boys at an internment camp in the United States during World War II. Some might argue that Bowers is simply unaware that the mass internment of people of Japanese ancestry—including American citizens—is considered a blot on the nation’s constitutional history and one of the nadirs of civil liberties, in a history checkered with shameful moments. Yet Bowers, an attorney, has refused to take back his comments. Given a chance to clarify his position late Wednesday, Bowers called himself a student of Roosevelt: “I understand how difficult a decision he made, but in the light of what was going on at the time he made the right decision,” Bowers said. Any student of FDR understands that the lesson of the Japanese internment camps is that fear makes us stupid and careless. Lives were ruined by intemperate and punitive racial policies that led to mass detention of those who bore the scantest racial connection to our enemies. At first blush we suspected that Bowers was simply learning his constitutional history from one of those Texas textbooks that rewrites epic moral failures as valorous events. But as bad as FDR’s internment order was, the enduring moral sin of the internment camps was that the Supreme Court had a chance to correct the mistake—and opted not to. That decision, as a technical matter, remains good law today. Bowers is seemingly not alone in his conviction that the lesson of Korematsu v. United States—the Supreme Court’s massive failure to reverse and condemn FDR’s error—is that penning in those who look like your attackers is and was a tremendous idea that served the nation well. Luckily, Korematsu itself offers contemporaneous predictions, in the form of its eloquent dissenting opinions, that someday, history would be ashamed. Following the surprise bombing of Pearl Harbor on Dec. 7, 1941, by the Japanese, FDR issued Executive Order 9066, granting the U.S. military the power to designate military areas from which people could be excluded to protect domestic security. As part of implementing this order, the military went on to ban “all persons of Japanese ancestry, both alien and non-alien” from a designated coastal area stretching from Washington state to southern Arizona and set up internment camps to hold more than 100,000 people fitting this description—two-thirds of whom were U.S. citizens—for the duration of the war. Dust storm at a War Relocation Authority center where evacuees of Japanese ancestry were held, July 3, 1942. The case challenging this policy reached the Supreme Court in 1944. It involved Fred Korematsu, an American-born citizen of Japanese descent, who was convicted when he refused to leave his home in California in defiance of this order. 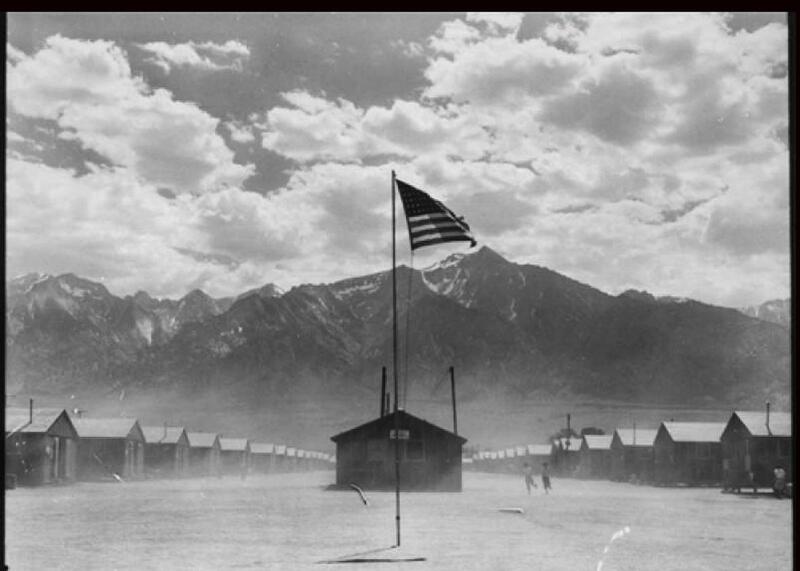 The U.S. military had asserted in this case that the loyalties of Japanese Americans could not be trusted to lie with the United States over Japan and that since separating “the disloyal from the loyal” was logistically impossible, the internment order had to apply to all Japanese Americans within the restricted area. The court agreed, finding that the nation’s security concerns trumped the Constitution’s protections, with a 6–3 majority upholding Korematsu’s conviction. Only through the long lens of history has the policy come to stand as a cautionary tale of what happens we betray core constitutional principles in times of fear and uncertainty. Today Korematsu is considered one of the court’s most cowardly opinions. A report issued by Congress in 1983 declared that the Supreme Court’s decision in Korematsu was “overruled in the court of history” and the Civil Liberties Act of 1988 contained a formal apology—as well as monetary reparations—to the Japanese Americans interned during the war. Justice Antonin Scalia has ranked Korematsu alongside Dred Scott, the 1857 decision denying citizenship to blacks, as among the court’s most shameful mistakes. In 1998, President Bill Clinton belatedly awarded Korematsu himself the Presidential Medal of Freedom. But history also reminds us that the court itself did not speak with one voice when Korematsu came down. Even in the heat of the moment the three dissenting justices warned that the nation would someday regret the xenophobia and the recklessness the court itself had approved. Those dissents are a powerful reminder—even 70 years later—that sometimes our better angels know best. 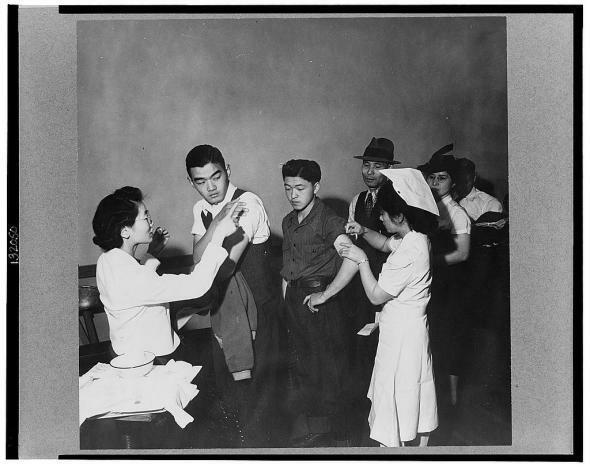 Evacuees of Japanese descent being inoculated as they registered for evacuation and assignment, later, to war relocation authority centers for the duration of the war, San Francisco, April 1942. Justice Robert Jackson characterized Korematsu’s conviction as a result of “merely … being present in the state whereof he is a citizen, near the place where he was born, and where all his life he has lived.” The nation’s wartime security concerns, he contended, were not adequate to strip the internees of their constitutionally protected rights.